This high quality sushi table is manufactured using side compressed natural bamboo, with a hand made totally natural waterbase finish. 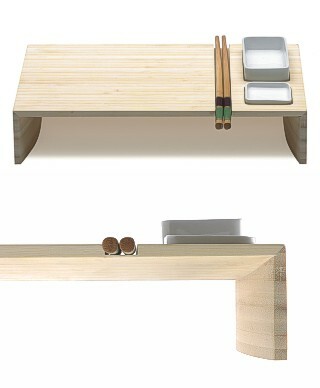 The main body of the table is perfect for laying out your nigiri, sashimi, or indeed any other type of sushi. To the right of the table are conveniently allocated spaces for chopsticks and square dishes. The chopsticks included with the table are made using environmentally friendly bamboo and nestle conveniently in the carved section for ease of use. The table also comes with 2 ceramic bowls to house your gari (pickled ginger), wasabi and soy sauce. The table top measures 30 by 20 cm (11¾ by 7¾ inches approx.) with a height of 5 cm (2 inches approx.). Enjoy your sushi in style with this attractive high quality product.